External combustion - Internal cooling engine: I guess we can close the cycle of the unit with a "clean power"
I guess we can close the cycle of the unit with a "clean power"
Let's apply a "clean power" on the last working substance (with the lowest boiling point) - gas is liquefied under pressure of compressor and not because of the low temperature generated by the compressor on cooler ( in my patent I use the old - System of Redistribution on Heat , instead cooler). Chart 1c - two working substances and compressor. Chart 3c - three working substances and compressor. 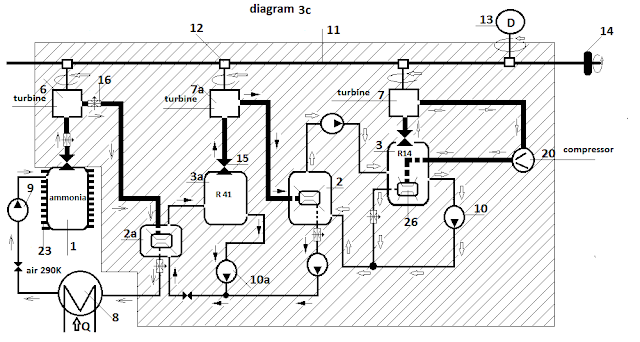 My opinion is that this unit will be effective - three useful energy (turbines) against the compressor - a ratio of beneficial to opposing forces - 3 to 2? Accept objections (not only for versions with "clean power"). I patented and other effective (by me) variants of external combustion - internal cooling engine, which put them in my blog next week. 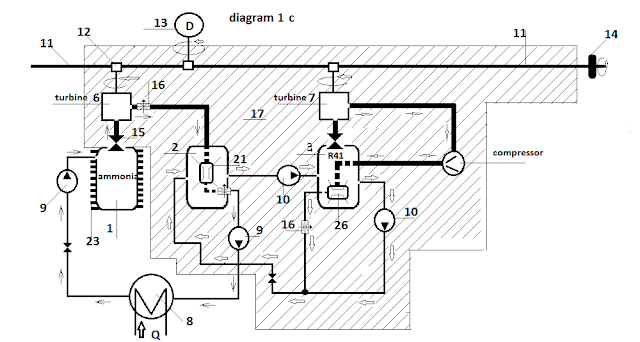 There are interesting "thermodynamic - mechanical puzzles." I think it is worth a look dear readers. Публикувано от Svetozar the Cold в 1:36 ч.